Monterchi is a particularly special hill town because it has a famous fresco by the quattrocento artist Piero della Francesca, painted between 1455 and 1465. This Renaissance gem is quite a surprise to come across. Piero drew his inspiration from a pagan ritual that pregnant woman would perform. They would bath in the Cerfone river that passed through Monterchi, convinced that their child would be delivered safely if they did. The waters of this river were dedicated to the Umbrian god Cerfo and believed to be miraculous. Piero’s fresco “La Madonna del Parto” (the pregnant Madonna) is an extremely rare portrayal of the virgin with child. The artist’s mother ‘Romana di Perino da Monterchi’ lived on the outskirts of Monterchi as you head towards Lippiano. Today, woman who are expecting, visit the sublime Fresco, housed in the old school house of Monterchi ‘Museo della Madonna del Parto‘. Piero’s masterpiece was painted in the church of Santa Maria Momentana in Monterchi, which collapsed in 1785 so the salvaged fresco was moved to a newly built church on the outskirts of Monterchi by the cemetery. For some reason it was moved again about 25 years ago, this time back to the heart of Monterchi and the above mentioned disused Mussolini schoolhouse, which just happens to be adjacent to two restaurants, so visitors can easily find somewhere to eat. An old man in the chemist once told me excitedly that “Monterchi has everything”. Everything he felt one could possibly need in life! There are two banks, a chemist, two grocery stores, a fruit & veg’ shop, two bars, a petrol station, a mechanics, a barbers, a pizzeria, five restaurants,(my favourite being La Pieve Vecchia), a news agents, two churches, a theatre, a park, two shoe shops, a watch mender, a palazzo, a Sunday market and a Franciscan monastery. Monterchi dates back to the culture of the ancient Umbrian’s and gets its name from “Mons Herculis”, which may derive from the temple which was probably built on the hill. Hercules is the protector of water! 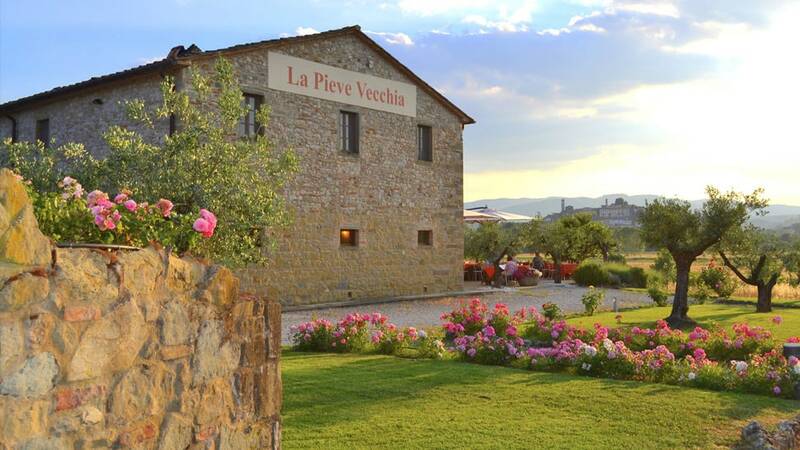 La Pieve Vecchia wins hands down (follow their Instagram here). Housed in a large attractive old farm building situated in an antique parish zone “Pieve”, with dining terraces facing beautiful Monterchi across the fields, Gianfranco and Catia have created a restaurant that engulphs so much more than just the wonderful dishes they place in front of you, to ooos and ahhhs of delight. The setting for a start in summer is perfect. Delicately coloured immaculate starched table cloths under huge chic sun umbrellas greet you on the large terrace amid 200 year old olive trees. The menu is changed regularly, giving customers a new experience and impression each time of chef Gianfranco’s culinary skills, always highly original and beautifully presented. The wine cellar is extremely good. But on tap simple and delectable ‘spina bianca frizzante’ in a chilled glass jug, is undeniably delicious on a hot evening. The atmosphere is relaxed and rarified although this restaurant is reasonably priced and from first appearances; decor, service and turnout, some might imagine they’ve entered a five star eatery. The staff that greet you and show you to your table are young and friendly. Nothing is ever too much trouble. La Pieve Vecchia also has a pizza menu in the evening. Having been shown your table and having sat down, the basket of home made twist rolls, sprinkled with ‘sale grosso’ and hidden folded under a crisp napkin are irresistible. People travel for miles to reach this superb restaurant but for us, it’s just on our doorstep, 10 minutes from La Buia. Perfect for celebration dinners. I can’t think of many places more enticing to be on a summer evening in Umbria. 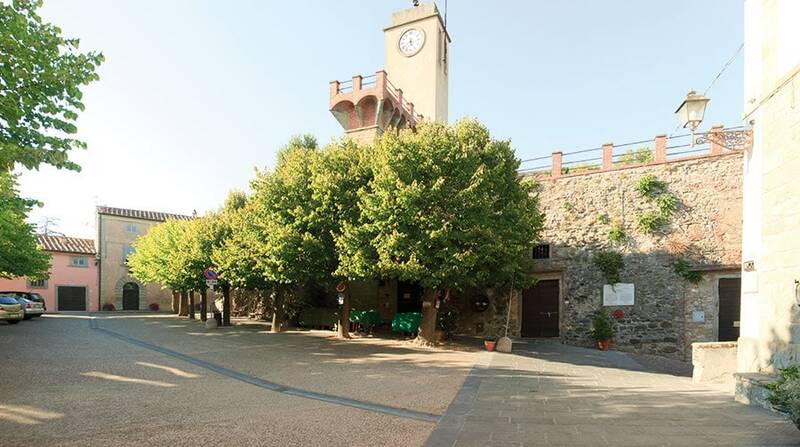 In the piazza alta in Monterchi, sitting out on a sun drenched evening under the lime trees, with a plate of home made pasta and a glass of wine from Laura’s restaurant “Il Trovato” is an experience that will transport you back to a bygone era of simple and good Italian fare. All around this charming hill town, colourful fields skirt out adorning the place. Olive trees glisten on the roadside and a profusion of trailing geraniums in brilliant reds and pinks herald your arrival. I’m always amused by the fact that the next town on towards Città di Castello is called Lerchi, reminding me of a childhood story but fortunately the sky never seems to fall that often, only a sprinkling during the night that waters everyones plants and cleans away the heat and dust of the previous day. The market sells plants, flowers vegetables and fruit, dish cloths, clothes and various other items but one of the main reasons for going is of course the Porchetta Van. Husbands skip breakfast at home and instead seek out a porchetta roll with a selection of ‘magra mista’ slices of roasted pork inside a hard shelled but wonderfully soft centred panino. An enormous pig is stuffed with garlic, fennel, and other herbs and traditionally roasted in a sealed oven. The crackling has to be seen to be believed! The counter over which your roll is handed to you, after you’ve watched through the glass panel at eye level, pointing to the preferred cuts you’d like included which can be a slice of liver too, it is then sprinkled with salt, slammed shut, crinkled up in a sheet of waxed paper and handed down to you. Tastebuds at this point are almost beyond control! Enviable customers jostle forward after you’ve made your escape through the throng, keen to be served next. 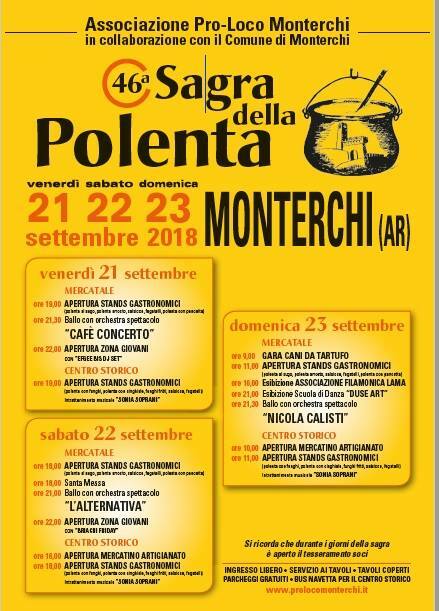 In September, around 19th-20th & 21st, Monterchi holds its SAGRA, like all towns and villages in Italy. Monterchi has chosen the turn of seasons to festa and therefore the menu has to be POLENTA! The huge maise plants have been stripped from the fields and ground into polenta flour which is either made into blocks and grilled or poured into a vast cauldron making a sticky mass large enough to feed the entire inhabitants of Umbria! Well thats what it looks like to me. On top, a generous ladel of ragu is poured and then a sprinkling of parmesan cheese. Nectar! Music plays in the piazza, wine flows like the Cerfone river and everyone settles into a jamboree of gossip, joking and eating. The solid iron barbecues churn out sausages and cakes of polenta at a swift pace until everyone has eaten enough and the Comune coffers are full. Next morning, not that early, a retinue of helpers clean up the town. If you are looking for luxury accommodation in the local area, please browse our beautiful villa on our website.